but it's an individual because of the faux graniteware technique I've been using..
don't you think this would be adorable stenciled on a T-shirt or hoodie? I just love that bag Wendy!! Very cool bag!! Love the gift bag idea!! Lovely idea for Christmas gifting. I love the gift bag idea! I would have never thought to stencil with archival ink. Who knew? Oh wait, you did! That Archival ink stamps on everything...LOVE IT! I LOVE the gift bag! You are so sweet to offer them up as prizes! Yes saw your photo from Collins Group such a cool idea... took that simple bag from simple to "simple elegance" ... I love it . Definitely a must try and a great gift idea ! The gift bag and included supplies are awesome! I love using non-traditional ways to present a gift...this is perfect! And keep the faith...one day...one day. Love the stencils and bag! So glad you made it home safe. I think that happens so you can really appreciate well all goes well flying and connections. Oh, would really like a present from you. Thx. You know it is bad when my husband- a life long die hard Bears fan- agrees with your "Bears S**k" statement! Our dogs know to find a hiding place when the game comes on!LOL! I love the eco friendly bag! We have eliminated all commercial wrapping paper in our family, and it is so great and easy,too! Great ideas in these blog comments!! Your followers are such awesome crafters - kudos to you, Wendy, for attracting such wonderful peeps. Thanks for the chance to win lovely goodies. Love this and I can definitely see this on a T-shirt. And really love the lace pattern. Where did you find the bags? Wendy what a great idea. Can't wait to try it. I have a piece of muslin in my craft room to play with right now ! What a fun way to make the kits!!!!!!!!!! The bag looks great!!!! ohhh love this bag idea! I always use my reusable bags and this would be a great way to give someone their gift, making it a two for one deal! Very cute gift bag! And thanks for the helpful tips, too. These are great and so versatile! I think they would make really nice muslin stockings! In our family we always use muslin bags to hold stocking stuffers and each year they are different so this would be the 2014 Bligh Christmas bags! Love this bag it will make a great gift bag. Thanks for the giveaway. Love this bag! The colors are so pretty. It looks like something I could do too! The ink looks amazing on the fabric .. good idea to let it sit for a second before picking up the stamp. Can't wait for you to find the perfect hoodie and see what you create !!! Safe travels to Florida. Sorry bout your Bears .. GO PAC !! 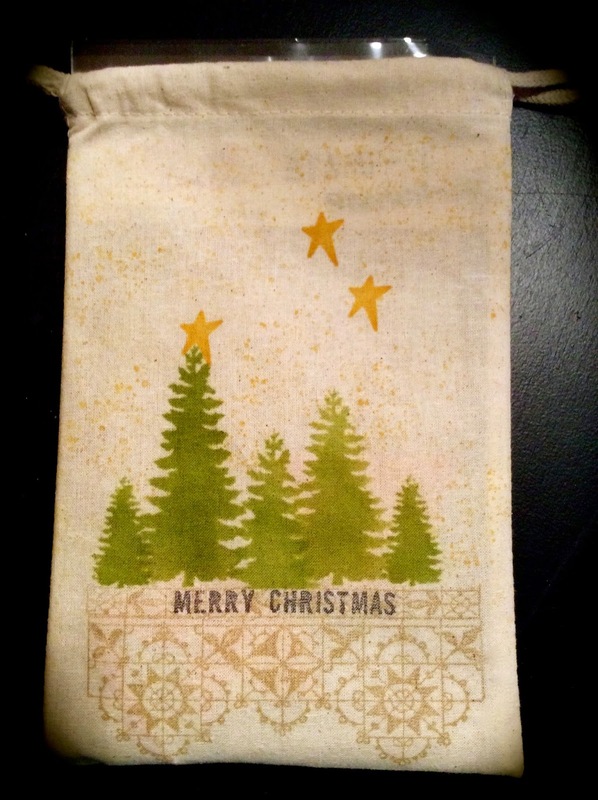 Ooh, I love those stenciled muslin bags! They would be great reusable bags for holiday gifts! Love the bag as a gift idea! Might have to make envelopes as I do not sew. Enjoy Florida. The weather here is getting a bit nasty now. I agree da Bears are looking hopeless again. Sad! Love the bag! It's so festive. I rarely do anything on or with fabric, but this seems like something I could attempt, for sure. Cute! I love working with muslin! This is brilliant, Wendy. I had no idea you could use archival inks on fabrics. I have just bought several new colours to complement the black and sepia that I already had, and now I have yet another use for them! Thanks for sharing. Your bag is beautiful. I particularly love the lacy stamp at the bottom. Thank you for walking us thru how and with what ink you used!! would love the stencils! What a sweet bag Wendy! I bet you had some happy campers in that class! Oh yes - what a great early gift!! Love this bag! Awesome bag for your class kit... a bonus for all the students! Bet the class was fabulous! I love this bag! Thanks for the inspiration & the chance to win a kit. Love the bag and what a great idea for gift cards at holiday time! Go Bills! Love it even more than when I saw it on the FB page. your so funny Wendy, The Bears. ha. Thanks for the chance, have a great weekend!! Oh I wish I was in Florida with you!!! I Actually broke out gloves tonight!! I love the tree stencils. Heck. I love all of your stencils!! Forget the Bears. Go Blackhawks!! Great bag. It has that stamp on it that I love. Thanks. 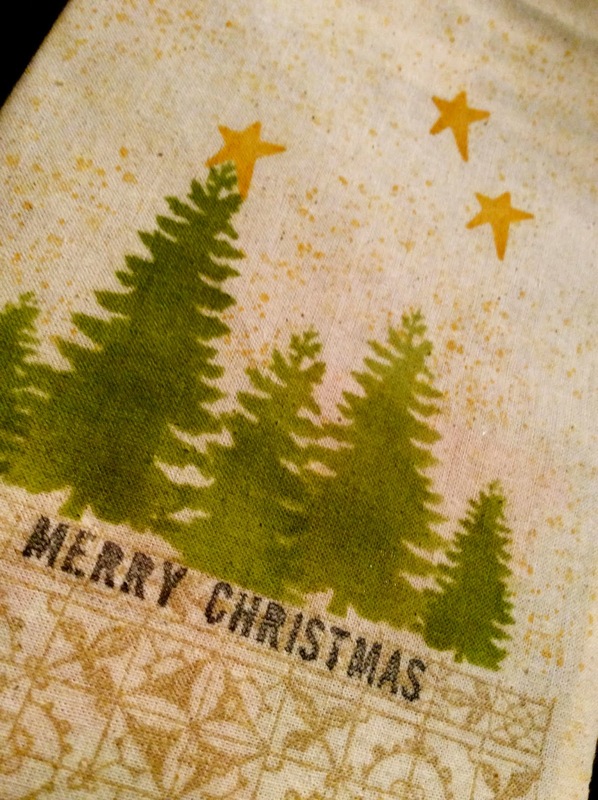 Love the Holiday Stencils!!!!! and the SiSi's are the bomb!!!! How adorable is this bag? What a beautiful lil bag. I just adore the stencils. How lovely these would make as a gift bag. Great ideas. 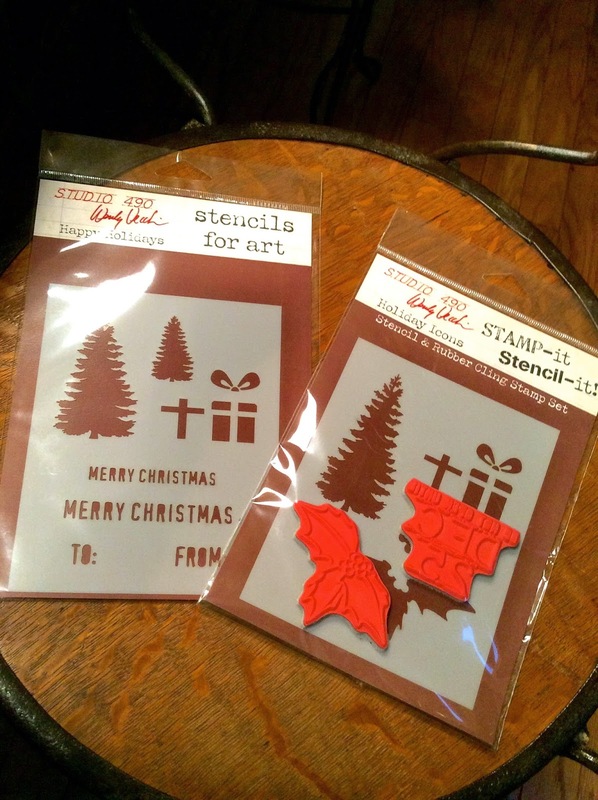 I love the Christmas stencils!! I love the idea of using the smaller muslin bags for gift cards! What a fun way to give gifts to co-workers! Awesome bag! We exchange home-made gifts at the family christmas gathering and I'm pretty sure mine will be presented in an awesome bag. Great idea!!! Thank you! This bag is adorable!!!! And it WOULD make a great holiday sweatshirt!!! wonderful bag. hope I'm in time for the drawing. What a great idea....seeings that Christmas will be very tight this year....this looks like something I can do for everyone! Personalized with names and all! I love the colours of your line of Archival inks and I am anxiously waiting for the embossing powders to arrive at my local store. Thank you for the instructions for the gift bag. Really lovely. love the bag ! so many possibilities ! The bags are so cute! So many great details. Thank you for the tutorial. The weather in Florida is even better right now. We are having a "cold" front. So we are in the 70's! Thank you for a chance to win and have a great Sunday evening! I love the idea to use the bags for gift cards!! I usually give my older grandchildren money for Christmas this would be a great idea for them!! Thanks for sharing, and so gracious of you to share a kit with us. Have a great week !!! NC weather is finally wonderful!! Such a cute idea! Thanks. Wendy I just love all you!!! what a great gift for your class attendees! bet they loved these! I'll be caseing this idea for sure! I didn't know Archival was permanent on fabric! good to know archival inks work on fabric. haven't done a bag or shirt in years....time to stamp on fabric again. thanks for the chance to be included in your drawing.